Classic Bad Company Band Concert Posters and Memorabilia! Buy Online Now! Formed in 1973, the British hard rock outfit Bad Company was a supergroup comprising ex-King Crimson bassist Boz Burrell, former Mott the Hoople guitarist Mick Ralphs, and singer Paul Rodgersand drummer Simon Kirke, both previous members of Free. Straight Shooter, issued the following year, was another major success, notching the hit “Feel Like Makin’ Love,” while 1976’s Run with the Pack was Bad Company’s third consecutive million-selling record. After 1977’s Burnin’ Sky, Bad Company recorded 1979’s Desolation Angels, which embellished the group’s sound with synthesizers and strings; a three-year hiatus followed before the release of Rough Diamonds, the group’s final LP in its original incarnation. 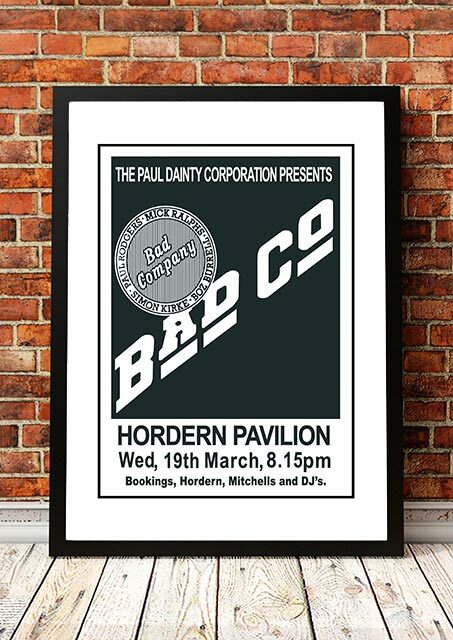 We stock some awesome Bad Company Band Concert Posters.